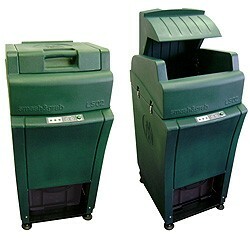 These ultra-strong boxes have been specifically developed for use with Smash & Grab Glass Recycling Ltd's "Little Smasher". Waste glass bottles are an expensive and irritating problem for Licensed Retail Premises, and raise environmental concerns as most glass is currently disposed of into increasingly scarce landfill. 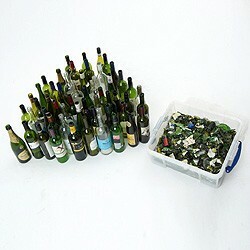 Smash & Grab Glass Recycling Ltd approaches the problem by tackling glass waste where it arises and providing an efficient and reliable collection service. They have designed and produced a radically different glass smashing machine - the "Little Smasher" which is simple, small and easy to install. The "Little Smasher" takes 15-20 wine and beer bottles at a time into its top-loading hopper and smashes them down to 20% of their original volume in less than 6 seconds. 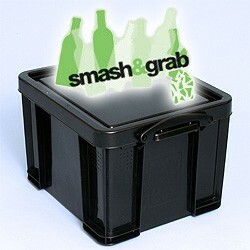 The smashed glass automatically collects in a 35 litre Really Useful Smash & Grab Box under the machine. It will hold the equivalent of 60 smashed wine bottles or 100 smashed beer bottles. These boxes are even tougher than our extra strong boxes! As well as being made from a special grade of high impact plastic, additional material is used to reinforce the bottom of the boxes. These boxes are much stronger than all other models and are perfect for use with Smash & Grab Limited's "Little Smasher" as well as all uses where the contents require maximum protection from damage e.g. courier boxes for parcel deliveries or airfreight.